in various government offices and courts across India. There are total 898 vacancies are going to fill through this SSC CHSL Exam 2019 recruitment. Suitable qualifications having candidates can apply online @www.ssconline.nic.in from 05-03-2019 to 05-04-2019. Selection for these SSC Clerk, JSA vacancies will be filled through three different stages of Tier 1, Tier 2 and Tier 3. 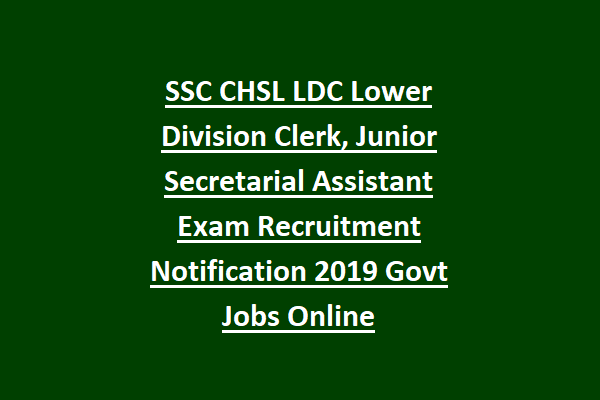 There is not interview for SSC CHSL Exam 2019 Lower Division Clerk and Junior Secretarial Assistant Jobs recruitment. For complete information regarding SSC CHSL Exam LDC, Court Clerk vacancies Exam Syllabus, Patter of Exam, age limits, Typing Test or skill test details, important dates and more details are given below. 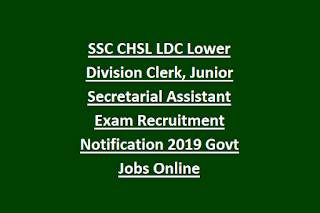 There are total 898 vacancies available in this SSC current recruitment through CHSL Exam 2019 Lower Division Clerk, and Junior Secretarial Assistant Jobs. As on 01-08-2019 candidates age limits are 18-27 years. The candidates date of birth should be in between 02-January-1992 to 01-08-2001. For SC/ST candidates 5 years and for OBC candidates 3 years of age relaxation is given. 10+2/12th class/Intermediate from a recognized state or central board. Those Degree qualifications having candidates also eligible to apply for these vacancies. For General and OBC candidates fee is Rs.100/-. For women and SC/ST candidates no examination fee. Selection for LDC, Court Clerk will be held in 3 different stages. Computer based Online written test will be held for 200 marks with 1 hour 15 minutes duration. Written exam consist of 100 questions and each question carries two marks. Written test consists of 4 different topics. Eligible candidate can apply online @www.ssconline.nic.in. Fill all the required field and upload the signature and photo images. Pay the fee online through net banking or using debit or credit cards. Apply Online here for SSC CHSL Exam 2016 LDC, Court Clerk Recruitment.